On July 6, the United States imposed 25 percent tariffs on $34 billion worth of Chinese goods. China hit back with tariffs on a similar scale on the same day. 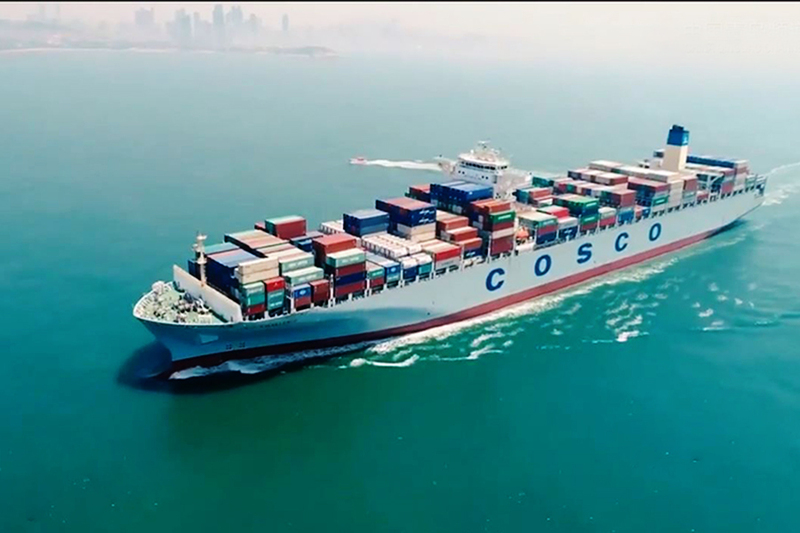 News reports say that another $16 billion of U.S. tariffs targeting products under China’s “Made in China 2025” program would go into effect two weeks after the July 6 tariffs. On July 10, the Office of the United States Trade Representative announced 10 percent tariffs on another $200 billion worth of Chinese goods. The $200 billion of tariffs is part of the $500 billion in additional duties which President Donald Trump said he is planning to impose should China retaliate. In all, U.S. tariffs could reach $550 billion, or more than the total value of goods China exports to America. The Sino-U.S. trade war is underway. The ability to increase foreign exchange earnings looks set to become a critical factor for the U.S. and China as the trade war drags on. To determine whether China has sufficient “ammunition” to withstand the trade conflict and to what degree, we take a look at China’s imports and exports, its net position of foreign investment (actual use of foreign investments minus foreign direct investments), and its foreign exchange reserves. 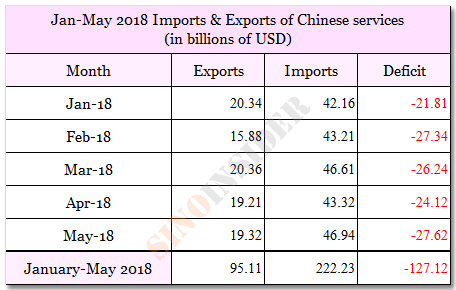 According to National Bureau of Statistics of China (NBS) data for the period of January to May 2018, China’s total imports and exports was $1.81445 trillion (up 16.8 percent YoY). Total exports was $957.06 billion (up 13.3 percent YoY) and total imports was $857.39 billion (up 21 percent YoY). China’s trade surplus was $996.7 billion, down 26.8 percent from the previous year. However, we have discovered that the NBS has been consistently releasing “erroneous” figures this year (see here and here). A comparison of the NBS 2018 figures and official data from the same period in 2017 reveal that the NBS had inflated the growth rate for exports and imports, while lowering the decline rate for the trade surplus. From the above statistics, China’s trade growth in the first five months of 2018 came mainly from an increase in imports. This led to a shrinking trade surplus. China’s trade surplus between January to May fell 54 percent from the previous year to $99.67 billion, while it saw a trade deficit of $5.27 billion March. This suggests that China is making less foreign exchange earnings from foreign trade. The table above shows that China makes its trade surplus chiefly by exporting to America. 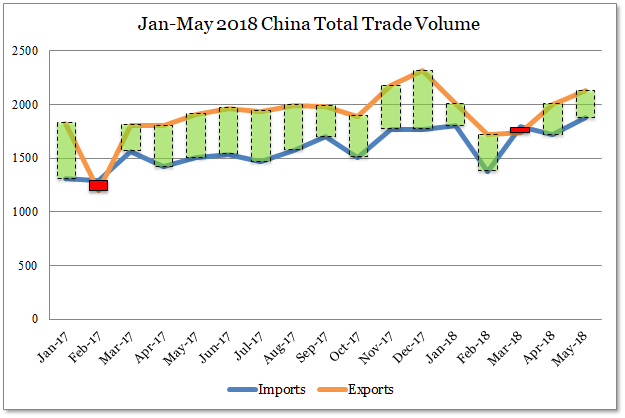 For instance, China’s total trade surplus to the U.S. from January to May 2018 was 5.39 percent higher than China’s total national trade surplus in the same period. And when China incurred a trade deficit in March, exports to the U.S. saw a surplus of $15.43 billion. With U.S. tariffs against Chinese products having come into effect, China’s ability to boost its foreign exchange earnings would be greatly reduced. China’s service trade has been in the red for some time. From January to May, China’s services trade deficit expanded to reach $222.23 billion, a 25 percent increase from a year ago. This deficit is over twice the trade surplus made from trade in Chinese goods in the same period. Foreign investments to the mainland is another channel where China can increase its foreign exchange earnings. China’s actual use of foreign direct investments and foreign direct investments grew in the first five months of 2018. 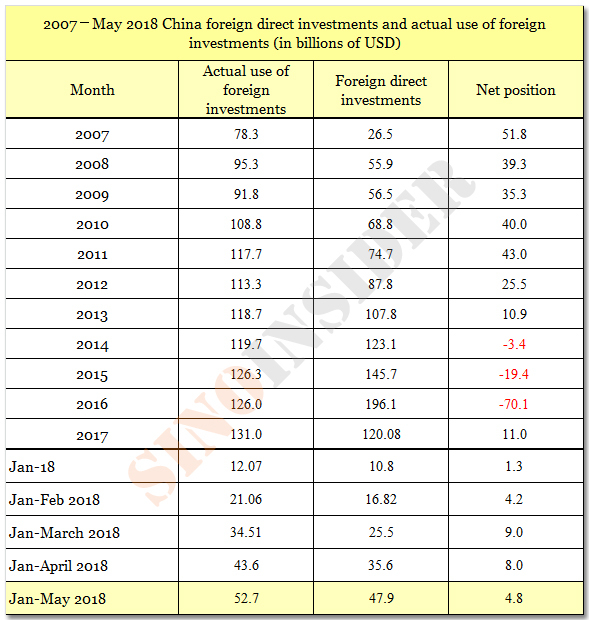 Since 2017, the Chinese authorities have been increasing capital controls and sharply restricting domestic investment abroad. After the 19th Party Congress, Xi Jinping has also rolled out various opening up measures, such as lifting foreign investment caps in China’s financial sector. The measures has reversed the trend of capital flight which started in 2014, but gains in foreign investment net position are limited (only $4.8 billion). China’s foreign exchange reserves increased by $1.5 billion to $3.112 trillion in May, according to People’s Bank of China (PBoC) data. Previously, the country’s foreign reserves had fallen for two consecutive months, or a drop of $17.97 billion in April and $14.23 billion in May. 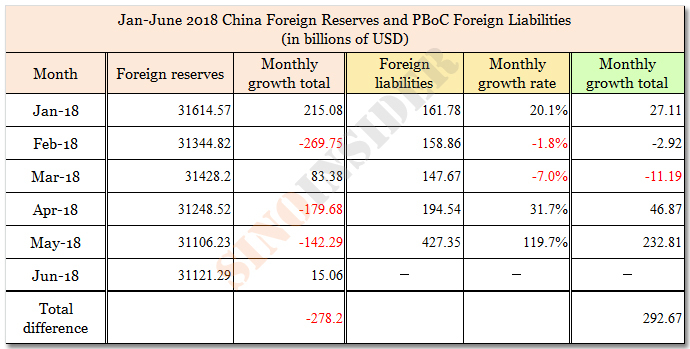 An examination of the PBoC’s assets and liabilities data shows that the central bank had been substantially increased its foreign debt when China’s foreign reserves fell in April and May. 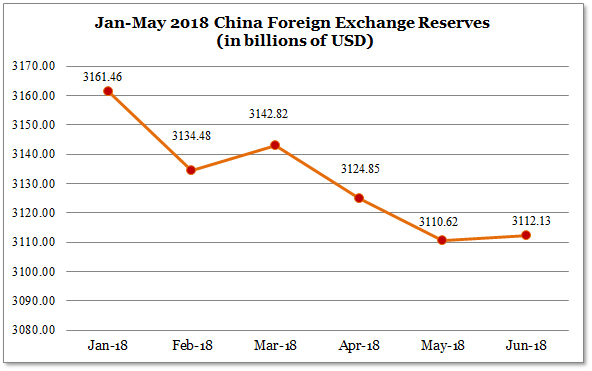 From January to June, the cumulative reduction in China’s foreign exchange reserves was $27.82 billion, while the cumulative increase of the PBoC’s foreign liabilities from January to May was $29.267 billion. The figures are close enough to suggest that the Chinese authorities are relying on taking on foreign liabilities to maintain its foreign reserves, and is preventing significant drops that could trigger a financial panic. 1. From January to May 2018, China’s total trade (goods and services) deficit reached a high of $27.45 billion, while the net position of actual foreign investment use was only $4.8 billion, or less than 20 percent of the deficit. That is to say, China’s foreign exchange earnings, a crucial trade war “ammunition,” are in the negative even before the U.S. fired the first shots in July. China’s foreign reserves should only continue depleting at this point. 2. China may have $3.1 trillion in foreign reserves, but China’s total foreign debt (including foreign currency) reached $1.84 trillion by the end of March 2018. If China and the U.S. embark on a full-blown trade war, foreign capital withdrawal of 30 percent would erase over $450 billion of China’s foreign reserves. If this scenario were to happen, then the Chinese authorities has only about $1 trillion of reserves left for use. 3. The PBoC has anchored the renminbi to the US dollar to establish confidence in China’s currency. In the hypothetical scenario where China’s foreign reserves are slashed by $1 trillion, the PBoC would have to withdraw 6.63 trillion yuan (based on the 6.6295 per dollar rate) in reserve money from circulation, or 20 percent of China’s total reserve money ($30.45 trillion) as of the end of May 2018. China’s economy would become severely depressed in such a scenario, and the renminbi would sharply depreciate if reserve money is not withdrawn.